You'll soon be able to make a Starbucks Pumpkin Spice latte from the comfort of your own home. Starbucks (SBUX) announced Wednesday that it's launching a new line of K-cups featuring the popular Pumpkin Spice Latte flavor. The new line is the latest collaboration between Starbucks and Keurig Green Mountain (GMCR), the maker of single-serve coffee machines. The "Starbucks Latte" line will also include caramel, mocha and vanilla latte flavors. It will be available in Starbucks cafes and in grocery stores starting this summer. 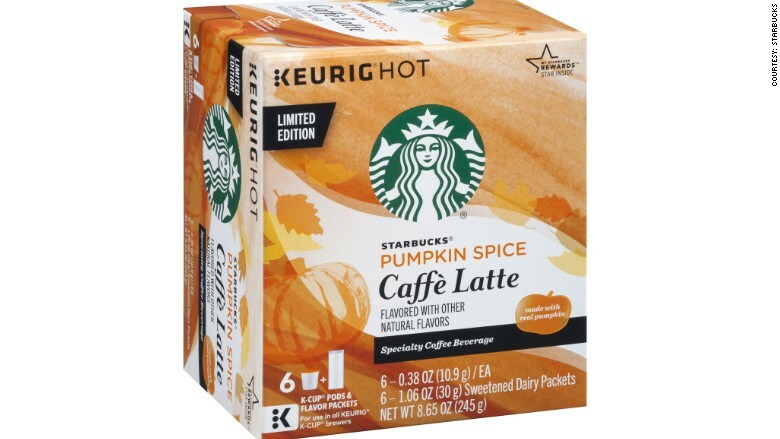 The Pumpkin Spice Latte flavor will be available in the fall. The drink -- referred to as the "PSL" by the company -- is a seasonal offering. Last year it was on the menu starting September 8, although die hard fans were able to get it a few days early, using a special password. The drink is flavored with pumpkin, cinnamon, nutmeg and clove. Its small size -- which Starbucks calls "tall" -- contains 10 spoons of sugar and 300 calories. Starbucks said the Pumpkin Spice Latte is one of its most popular seasonal beverages, along with the Gingerbread and Eggnog lattes. The drink has been around since 2003. It sparked a pumpkin flavor craze, causing pumpkin sales to skyrocket in recent years.